Cake pops may just be the perfect party treat. They are bite-sized, fun, and even more delicious than regular cake. Cake balls have frosting mixed in with the cake to give these bite-size desserts the perfect texture. 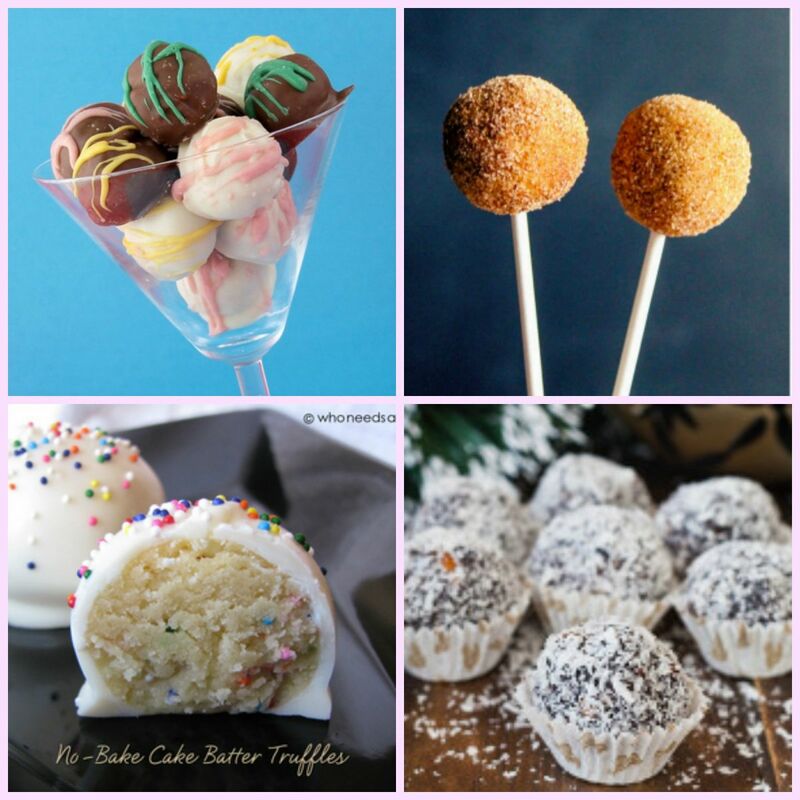 This collection of 12 Cake Balls Recipes and Cake Pop Recipes offers incredible recipes for these super fun desserts. Cake Pops come in all sorts of flavors. Some are made with cake mix to make the recipe simple, while others use cake from scratch as their base. Whatever your preference may be, there is no wrong way to make a cake ball. Below you'll find No Bake Cake Balls, which are perfect for bakers who love the taste of cake batter. We also have a variety of Baked Cake Balls for those who prefer the taste of oven-fresh cake. And, of course, we've also included our Cake Pop Recipes. These treats are basically cake balls served on a stick so that they are portable and easy to serve. When it comes to picking out which cake pop recipe to make, you can't go wrong. No Bake Cake Batter Cake Balls - This is one of our favorite no bake dessert recipes at TheBestDessertRecipes.com. These cake balls are delicious, and because you don't have to bake them, they take less time to make than many cake ball recipes. Cake Batter Truffles - This recipe is ideal for parties because the recipe makes dozens of cake balls. The vanilla cake batter filling tastes better than any baked cake. For more great no bake desserts, check out our FREE eCookbook, No Bake Desserts: 19 No Bake Dessert Recipes. Dark Chocolate Cake Balls - There's no better cake ball recipe for chocolate lovers. Once you've coated these cake balls in chocolate, you can roll them in chopped nuts to give them an extra crunch. Classic Chocolate Rum Truffles - These truffles use chocolate cake mix to speed up the cake ball process. If you want to make your dessert alcohol-free, you can easily use a bit of rum extract rather than true rum. Chocolate Cherry Bombs - These cherry bombs are perfect for fans of chocolate covered cherries. These cherries are surrounded with chocolate cake and dipped in chocolate. 4-Ingredient Rum Truffles - This cake ball recipe is as simple as it gets. This recipe uses leftover chocolate cake, but you can also whip up a box cake if you don't have any leftovers. The chocolate and rum flavors go together wonderfully. Chocolate Hazelnut Cake Balls - These chocolate cake pops have a hint of hazelnut and orange for a sophisticated, delicious taste. Can't get enough cake recipes? Our collection of 93 Easy Cake Recipes is perfect for you! Paper Straw Cake Pops - If you don't want to waste time and money going to the store to buy cake pop sticks, you can easily use extra paper or plastic straws that you have in the pantry. Snickerdoodle Cake Pops - These cake pops have the comforting cinnamon sugar taste of a snickerdoodle cookie. Hostess and Little Debbie Snack Cake Pops - You don't even have to bake a cake for these cake pops. All you have to do is transform your favorite Hostess snacks into bite-sized treats. Spirited Football Helmet Cake Pops - Game day is one of the perfect occasions for cake pops. This recipe gives you tips on how to decorate your cake pops to support your favorite team. Cake balls are so perfect for parties and showers because they pretty much serve themselves!